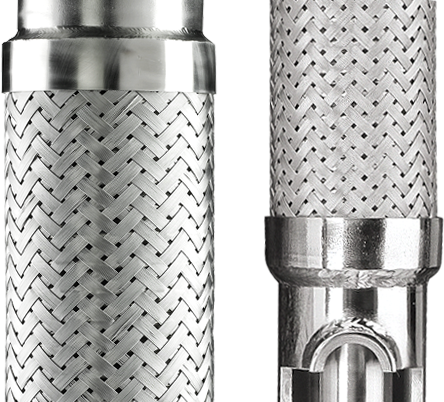 Interflex is Hose Master’s general purpose interlocked metal hose which is used to convey air, exhaust, and a variety of solid materials. It is constructed from a single strip of metal that is profiled and locked onto itself. The interlocked sections of strip are able to slide back and forth, thus providing the ability to flex. Extra-heavy SS construction provides outstanding resistance to abrasion, external damage, corrosion, etc. Not available in T-Rex construction. Packing may be added to minimize leakage associated with product transfer through a stripwound hose. High temperature elastomeric packing (HTE) and low temperature fabric packing (LTF) are available.